This Bacon Chocolate Chunk Deep Dish Skillet Cookie is the number one indulgence I would indulge in if I could choose any dang food in the world to celebrate with. The cookie itself is Paleo, AIP, and gluten free and is seriously the most balanced dessert I can imagine. It’s salty from the bacon, creamy from the chocolate chips, and sweet from the cookie. Plus, it takes on the form of a bar, a pizza, and a cookie all at the same time – what’s not to love about that? Well hot damn, hallelujah, Grass Fed Salsa turns four this week! 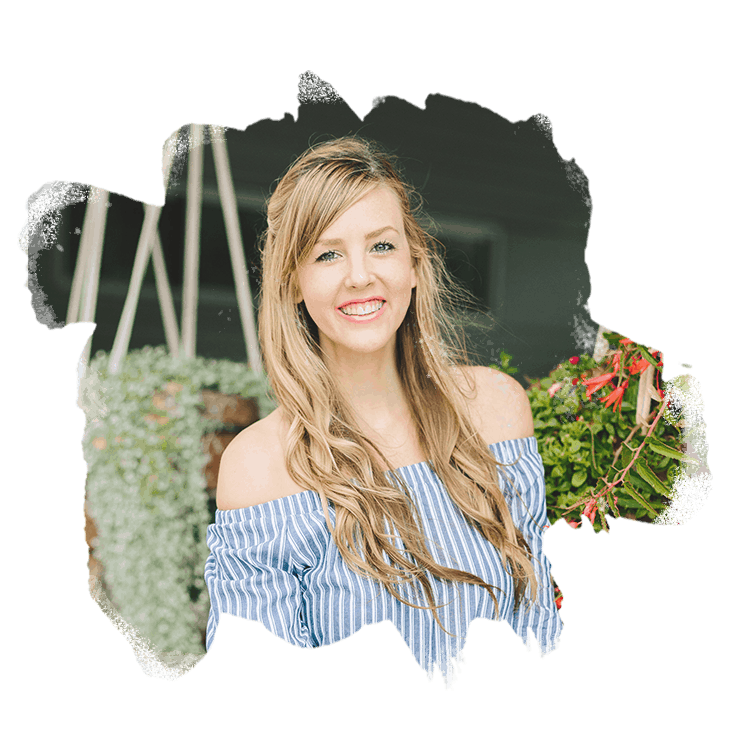 This site started as a tumblr where I shared quotes from my then boyfriend, now husband, and then blossomed into a nutrition and recipe website that well over 600,000 people have visited (we’re on track to hit 1,000,000 very soon!). I like to think each and every one of them (you!) found a recipe to share with their family, valuable health advice, and a relatable person talking to them from the other side of the screen. 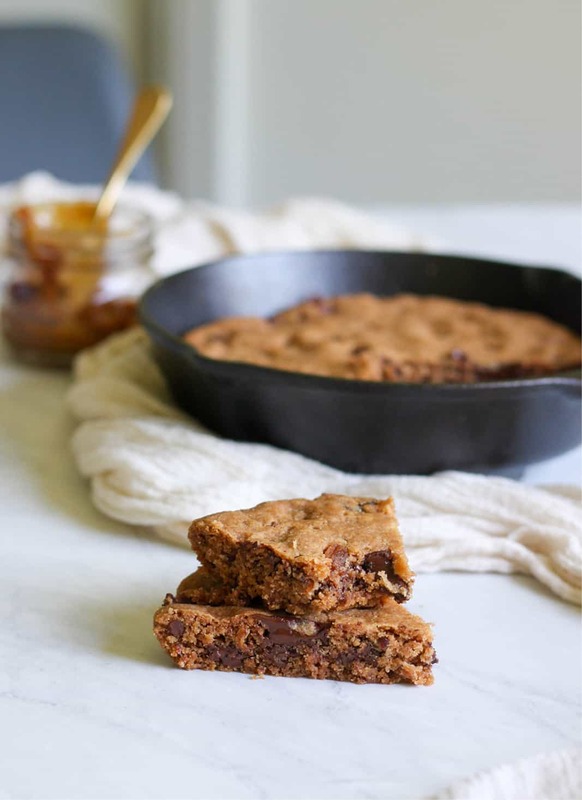 But enough about Grass Fed’s birthday, let’s get back to this skillet cookie! This cookie is the perfect balance: crispy around the edges and soft in the center. It’s salty from the bacon and sweet from the chocolate chunks. It truly is the perfect combo of savory sweet I’ve ever indulged in! As a quick disclaimer: this dessert is not your average AIP or Paleo dessert. Yet I’m unapologetic about calling this skillet cookie AIP and Paleo when it contains all of that, because barring extreme circumstances, an occasional indulgence in a higher sugar and carb treat will not wreck you. 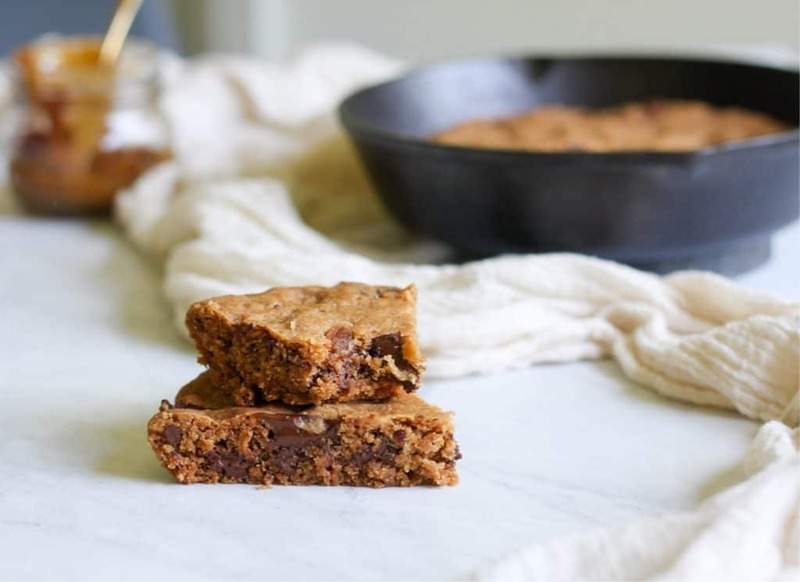 Should you make this skillet cookie once a week if you’re following a healing protocol? Definitely not. But having compliant recipes on hand to enjoy for the occasional celebration (like the day your blog baby turns 4 years old!) is so important in keeping you from feeling deprived and prevent you from becoming resentful of your healing protocol. The moral being: indulging is important. 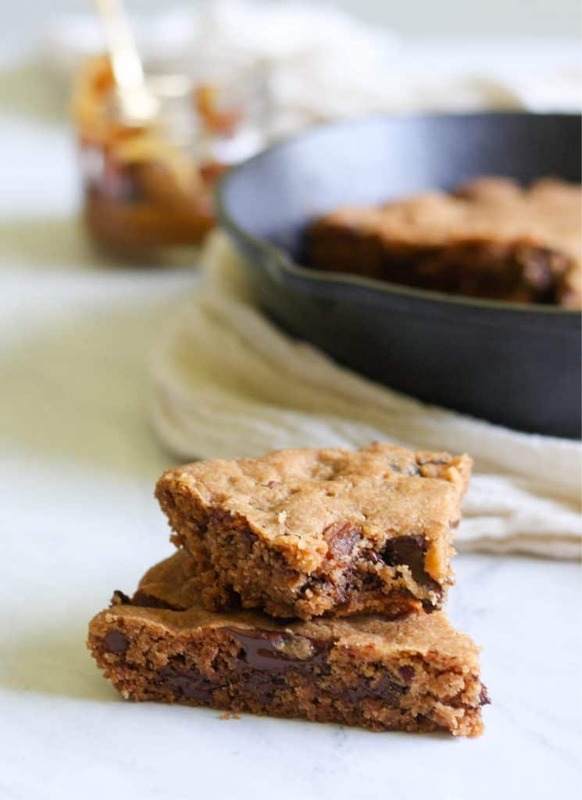 This fluffy, salty sweet Bacon Chocolate Chunk Skillet Cookie is soft and chewy on the inside and crispy on the outside, just as all good cookies should be. The palm shortening in the skillet cookie gives it the height and fluffy texture, and keeps it crispy for days. Don’t omit the gelatin in this recipe – it’s key! In addition to the beneficial vitamins, amino acids, and minerals the gelatin adds to this recipe, it also acts as a replacement for gluten. Gelatin, like gluten, acts as a glue to give the skillet cookie stability. 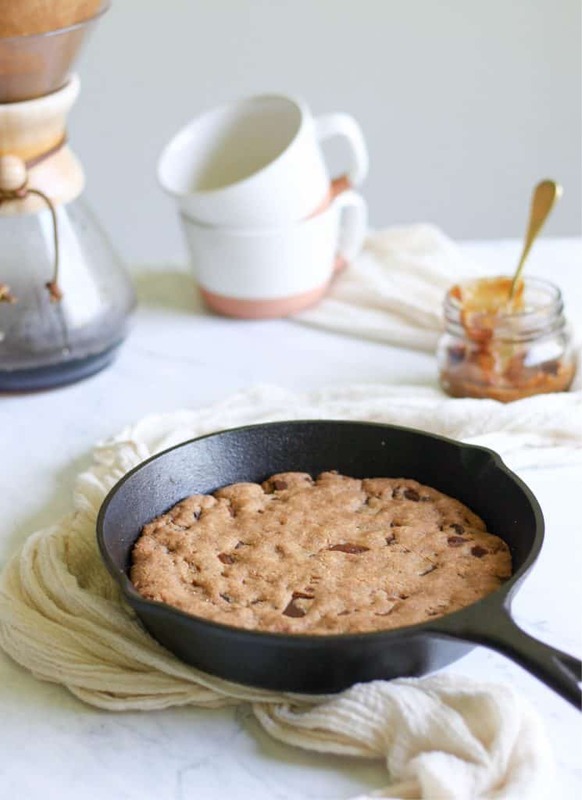 This Bacon Chocolate Chip Deep Dish Skillet Cookie recipe is the number one indulgence I would indulge in if I could choose any dang food in the world to celebrate with. 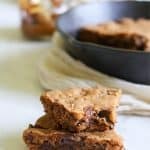 This skillet cookie is Paleo, AIP, and gluten free. Plus, it’s the most balanced dessert I can imagine – salty, sweet, creamy, and crispy. In a large sized bowl, cream shortening (see note #1 for measuring), syrup, sugar, and vanilla. Set aside. In a medium sized bowl, whisk flours,, gelatin, baking soda, cream of tartar, and sea salt until combined. Slowly add dry ingredients to wet and mix well to combine. Stir in bacon and chocolate chunks. Press into an 8″ cast iron skillet that is greased with shortening and sprinkle with coarse sea salt (optional). For a gooey center, bake for 12-14 minutes. For a cookie that is completely baked through and can be cut into bars, bake for 15-17 minutes. Remove from oven and let cool slightly before eating. Don’t try to cut the cookies until they’re completely cool or they’ll crumble. When measuring palm shortening with a standard measuring cup, it’s easy to not get the full amount as the shortening tends to get air pockets in the measuring cup. This means the final recipe can have wildly varying results, based on the amount of palm shortening actually used. For this reason, I recommend using a tablespoon to measure the shortening out (1/2 cup = 8 Tbsp), or melting the shortening to make sure the measurement is accurate. Coconut flour is highly absorbent, so if you want to replace with tigernut flour, reduce maple syrup to 2 tbsp and reduce palm shortening to 1/3 cup. I don’t have a cast iron skillet. Could I make this in a stainless steel skillet, and if so, would I need to change the cooking time?